Reason(s) for Denial: "You have NOT served sufficient time for punishment" & "Release at this time would involve an unreasonable risk to the public." Based upon the past parole decisions and prevailing changes in corrections since Truth-in-Sentencing was implemented, parole consideration was voluntarily waived and remains waived pending changes to the parole process and criteria for consideration under PAC Rules. In reviewing the present and past correctional and parole policies, the current system shows an inexplicable disparity in sentence lengths and time served before parole or other form of release; regardless of clear indications of rehabilitation, the discretionary functions of custody reduction and parole releases have all but stopped for "Old Law" inmates. While I can never grasp the responsibility of reviewing people convicted of serious crimes for custody reduction or parole release, the people vested with that authority have a duty to use discretion impartially and based on all evidence of rehabilitation, not to impose a secondary judgment of the offense. In almost 20 years of incarceration, I have completed every program required of me and many more taken voluntarily. I have gained the benefits of education, personal growth and maturity, and understanding of the affects of my actions. I can never change what I did, and what I did shouldn't be how I am defined in a "correctional" system. If I must serve all of my sentence for my crime, I accept that, but I was sentenced with the expectation of genuine parole consideration of my rehabilitation—that is all I am asking for now; direction to earn a second chance at life through parole. Commissioner Emily Davidson reported that, "At the time of the offense you had identified with an anarchy group and were reported to speak of a revolution killing and injuring officers." This was not accurate. My co­defendant made these statements and applied them to both of us in his statement for my pre-sentence investigation report. This was how the statements were included in the record in my sentencing transcript. At the hearing I explained this and admitted I never opposed these statements when he made them. Neither was there any "group". These inaccurate statements are very prejudicial in her report and decision. You have served 15 years of a 50 year sentence for 1St Deg Intent Homicide (Attempt)(w/Use of Dang Weapon)(Conceal ID). In Feb 1996, law enforcement responded to a report of a business burglary and encountered you exiting the building. One officer identified himself and directed you to stop, and in response, you turned around and shot a 40 caliber pistol with a laser site at the officer. Fortunately, the officer was wearing a cavalier vest, and the bullet lodged in the chest area the vest was covering. At the time of the offense you had identified with an anarchy group and were reported to speak of a revolution killing and injuring officers. At today's hearing, you explained the loss of your father at a young age resulted in emotional struggles in which you were unable to process your feelings. This led to acting out as a juvenile and feelings of extreme anger. During this incarceration, you were able to work through these emotions with the assistance of PSU staff. You have also completed recommended programming of CGIP, Anger Management, and Vocational Education in Braille Transcription. You have participated in a number of volunteer programs including the BRICK and Challenges and Possibilities. You have attempted to engage in victim offender dialogue through Restorative Justice. You have also obtained higher education courses and currently work at BSI. You have made significant progress during this incarceration, as evidenced by your accomplishments. Unfortunately, this positive progress was at the expense of an officer's safety and a community's security. Therefore, continued time is warranted to address punishment. Institution conduct has been positive with no problems in 10 years. This is expected to continue. Residence plan lists to live with a friend in Cumberland and you have also identified a number of families who are supportive. This requires agent approval when more time frame appropriate. Note: Comments by the District Attorney's office, strongly opposed to release were available for today's hearing. who reads this and finds it troubling should investigate the issues for a better understanding and contact their state government legislators, representatives, and the DOC Secretary, Mr. Edward Wall. NOTE: DOC Secretary Edward Wall has scheduled a community forum to discuss parole issues and mental illness in the DOC. This forum will be held on September 27, 2013 5 to 7 pm at Fountain of Life Church--633 W. Badger Rd., Madison, WI 53713. 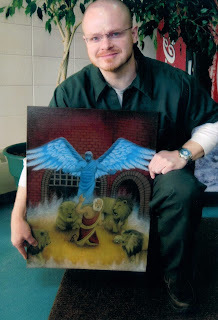 Simply put, the Wisconsin Department of Corrections is a state-created and sponsored business that trades in human suffering and is structured in such a way that the government will not allow it to fail--a condition synonymous to government bailout businesses. This agency relies on public fear—a fear that is so often generated and exaggerated by politicians. And this fear of needing to protect the public at all costs has resulted in the exponential growth of the financial costs and demands on the taxpayers to support the warehousing of Wisconsin citizens. Obviously, societies cannot function without an option for incarceration for serious crime; however, there can be better, more effective, and more humanitarian means by which we treat those we incarcerate, as a society. The administration of the Department of Corrections—in Madison and in the individual prisons—often perpetrates lies and deception against the public's perception through the misnomer that is in the title and supposed purpose of the agency—corrections. This practice has to change in order to change the system as a whole. Inmates and their families shoulder the burden of incarceration more directly than anyone else, and we are in the best position to see the inconsistencies, maltreatment, and malfeasance that is so prevalent in the Wisconsin Department of Corrections. If this agency is so concerned with corrections and rehabilitation, why does the DOC intentionally deny inmates access into their required treatment programs—programs that must be completed for parole eligible inmates before any genuine consideration for parole can be given? The answer given is always the abundance of inmates needing the limited resources of programs; however if this is the answer, the solution should be obvious—hire outside agencies who specialize in rehabilitative treatment programming. Instead, the DOC would rather deny inmates the chance for early release on parole. Moreover, the DOC admittedly would place a Truth-in-Sentencing inmate with a short sentence of confinement ahead of an Old Law inmate who could be paroled if their program needs were resolved. Therefore, this policy and practice creates a de facto authority within the DOC for parole denial, because the DOC knows the Parole Commission will not parole a person without the singular criteria of program participation/completion being met. This in one of many reasons why Old Law, parole eligible inmates are being held until their Mandatory Release (MR) dates or even past then to their Maximum Discharge (Ml)) dates when the inmate's offense places him/her under the Presumptive Mandatory Release (PMR) legislation. It's an unfair and corrupt practice that must be addressed. Another of the catch-22 policies and practices that the Department of Correction and the Parole Commission employs to deny eligible inmates parole and/or a lower security classification is the misdirection and confusion of respective duties and responsibilities. For instance, the Department of Corrections, via the Bureau of Offender Classification and Movement (BOCM), will not lower an inmate's security classification for progression through the system to minimum unless the Parole Commission gives the parole eligible inmate an 11-month deferment or less; however, the Parole Commission will not authorize a 11-month deferment without programming needs being met. The Department of Corrections often tells inmates that the Parole Commission can "endorse" an inmate for a program, but the Parole Commission has no authority to "endorse" treatment programming—their authority does not extend beyond the granting or denying of parole. The Parole Commission tells the inmate that the DOC can give minimum custody without an 11-month deferment, and while this fact may be true in reality, it is not true in practice. In addition to this, the Parole Commission rarely paroles anyone not in minimum custody, so the continuous back and forth and shifting of responsibility leaves the parole eligible inmate without recourse to earn parole or minimum custody. In discussing the issue of parole deferments, it should also be brought to light that the Parole Commission—via Kathleen Nagel, Chairperson, as appointed by Governor Walker (a governor who is steadfast in his decision to not grant any clemency petitions during his term in office)—has raised a significant number of inmate deferments without any justifiable reason. Men who have progressed over years of good conduct with numerous achievements have been receiving increased deferments without any negative change in circumstance. The obvious indication is the political agenda of a governor who opposes any type of discretionary release in response to rehabilitation. It is not coincidence that an author and proponent of Truth-in-Sentencing would enact a de facto policy directive to his appointee that eliminates true parole consideration for Old Law, parole eligible inmates so that these inmates receive the same treatment as TIS inmates for release, with MR dates being equivalent confinement periods. All of this is compounded by the existence of Truth-in-Sentencing (TIS). This bifurcated system has the effect of clogging the system for Old Law, parole eligible inmates. When a TIS inmate receives a sentence. of 2-3 years confinement time, they are most often given a minimum security classification. This means the limited space in minimum security—a security classification that is most often required by the Parole Commission to grant a parole—is taken up by TIS inmates. The effect is that Old Law parole eligible inmates are again denied a reasonable chance to earn a parole. Truth-in-Sentencing legislation has had the worst affect on the prison population expansion and the significant confinement sentences being given. The DOC must now address how it will care for inmates that will be, in the system for 20, 30, or 40 years. How can society truly believe any inmate having served such sentences will ever be able to properly reintegrate? inmates do not collect interest on this account; yet, it is ignorant to believe the DOC is not. How is the misappropriation of the accumulated interest of the inmate population not malfeasance? If the Wisconsin government wanted to investigate fraud, the investigation should start with the DOC. This fraud is most evident and plain in the Inmate Complaint Review System (ICRS). This system is structured to afford inmates an option for addressing grievances; however, in actuality, the system is nothing more than a biased and token system that is enforced by Inmate Complaint Examiners (ICEs) who do little to no investigation on complaints. As an investigative department, the ICRS dismisses probably 85-90% of all inmate complaints. Of course not all complaints are valid, but mathematically, that percentage is evidence of bias and an ineffective system. It's expected given most ICEs are former guards or DOC staff who are predisposed to distrusting and ignoring inmate concerns. However, as a multi-million dollar system that employees hundreds of people, the taxpayers are literally flushing their tax money down the drain. When it comes to money, the DOC is willing to go to extremes in creating rules. For instance, the DOC forces inmates to send even small property items out via UPS at an exorbitant rate because of contracted kick backs. This is also clear in the phone system the DOC employs, the limited property vendors, canteen, etc. These are just a few of the ways in which the DOC creates or uses rules to abuse inmates and their families, but there are many others to anyone interested in looking into the matter. Mental illness and the inmate health system are abysmal. Uneducated guards pass out medications that could be life threatening if improperly given. The understaffing of needed medical professionals borders on cruel and unusual punishment. To that fact, institutions, such as Oshkosh Correctional Institution (OSCI), on a routine basis allow inmate medication lapses of a week or more—these are medications that are critical in nature (i.e. blood pressure medication, cholesterol medications, psychotropic medications, etc.) or have adverse side affects if abruptly stopped. Moreover, Health Services staff routinely postpones scheduled doctor appointments for months to even a year or more based on understaffing. Yet, again, complaints on these issues fall on deaf ears when I brought through the Inmate Complaint Review System to uncaring and bias Inmate Complaint Examiners. This area of abuse is in serious need of attention and correction. All and all, the DOC is a flawed and ineffective system that is more abusive than corrective, and it doesn't need to be that way. The administration of the DOC should be more vigilant in the treatment of those they are legally and duty-bound to care for and supervise. On behalf of the inmates and their loved ones who are most affected, we would implore change to make this system truly one of corrections.